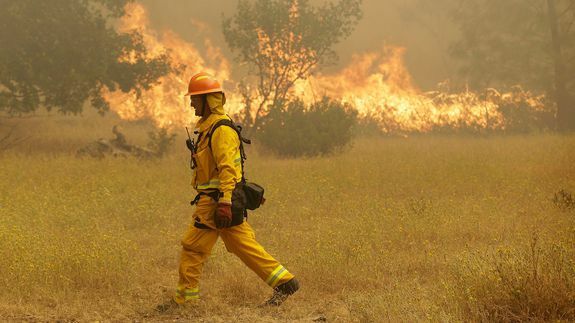 SAN FRANCISCO — A firefighter killed by a wildfire in Northern California became trapped by the erratic, wind-stoked blaze while he was scouting an area to decide how best to attack the flames, a U.S. Forest Service official said Saturday. Forest Service firefighter David Ruhl, 38, was driving down a road in the Modoc National Forest on Thursday when the fire grew suddenly and trapped him, Forest Service spokesman Ken Sandusky said. "He was trying to develop a plan of attack," Sandusky said.